While the April 28-29 Summit Racing Equipment Atlanta Motorama will feature well over 1,000 flashy classic, collector and show cars at the massive motoring festival at Atlanta Motor Speedway, the exclusive Million Dollar Salon will serve as the weekend home to some of the rarest and priciest vehicles money can buy. Headlining the massive two-day auto show dubbed "Georgia's Motoring Festival," the Million Dollar Salon will once again bring the "wow" factor for fans attending the show. Living up to its name (and then some), this impressive display located inside the Marcy Scott Media Center will feature a collection of cars valued well into the seven-digit range. From high-dollar Lamborghinis and Ferraris to barely-street-legal Mclarens and other rocket-like sports cars, it will be hard to comprehend the enormous concentration of near priceless automobiles in a single location. 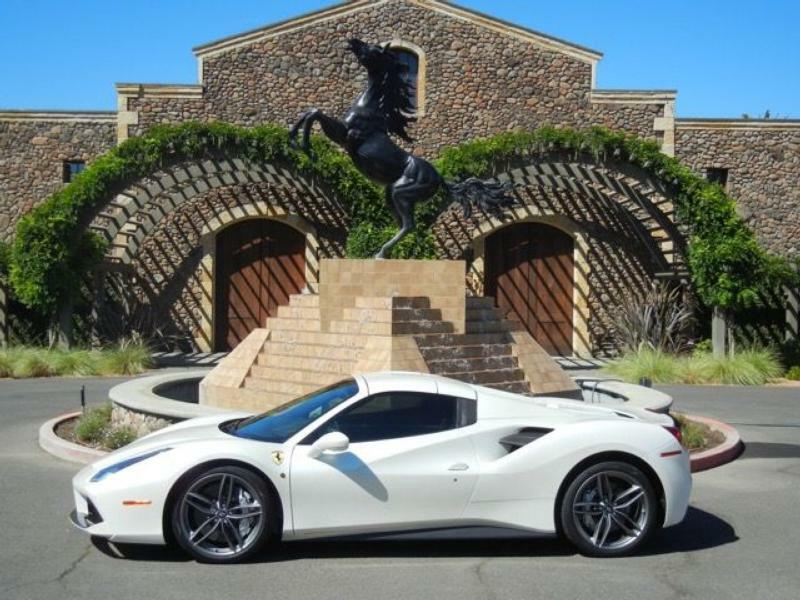 One of the featured Million Dollar Salon vehicles, a 2017 Ferrari 488 owned by Griffin resident Ronnie Powers, boasts a paint job worth more than most entire vehicles themselves. Named for its gem-like shine and pearl-tinted finish, Powers couldn't pass up an opportunity to own one of the few vehicles in the entire world with a Bianco Fuji paint job when he ordered his pride and joy on four wheels from the Italian manufacturer two years ago. "It's one of the few that were ever painted that color, which is like a crushed-pearl paint job," said Powers. "It was $27,000 extra to get that paint. It's expensive, and not many people will do it, but it was worth it for us." Of course, you can't just order up a Bianco Fuji paint job from your local automotive dealer, so Powers was willing to wait a little longer to have his Ferrari done up just how he liked before it finally arrived on a ship to the U.S.
"The guy at Ferrari told me the dealership couldn't order it in that color and that it had to go somewhere else first," Powers said. "Basically, I had to wait an extra two months to get it, because Ferrari didn't do that paint there at the manufacturer in Italy. I had to go somewhere else. "It's really pretty. I know Maserati has used that color or something similar too to it. It's a really pretty car, and it's got a lot of carbon fiber, which makes the white pop." And despite a total price tag well into six figures, Powers isn't afraid to put the rubber to the road and enjoy the hot rod of his dreams. "I think I've got 5,000 miles on it," said Powers. "We ordered it from Ferrari of Las Vegas, and it was shipped from Italy straight over to them. And then, we picked it up, and my wife and I drove to California in it and drove the Pacific Coast Highway. We've really had a chance to enjoy it. "We've put a bunch of miles on it, which is unusual. Most people that have those cars don't drive them, and I don't know why. What's the point of having it if you don't drive it? In addition to the Million Dollar Salon, the Show Car Garage will transform the track's NASCAR Cup Series garage into a vast auto exhibit with dozens of highly valued cars representing nearly an entire century of automotive history. Featured vehicles in 2018 will include six of the Great 8s from this year's prestigious Detroit AutoRama. The Great 8s are the eight final vehicles judged to be eligible for the coveted best-in-show "Ridler Award" at the annual auto show in Detroit. Each vehicle is widely considered to be among the most unique and well-built custom vehicles in the U.S. today. Great 8s coming to the Atlanta Motorama include a 1934 Ford pick-up, a 1936 Pontiac sedan, a 1940 Ford Coupe and a 1956 Lincoln Continental Mark II, among others. While rare and classic vehicles are one of the most popular attractions at the Summit Racing Equipment Atlanta Motorama, they're just one of many motoring attractions and entertainment opportunities at the massive two-day festival. Autocross competitions, BIGFOOT® car-crushing demonstrations, a massive vendor midway, the Pull-A-Part swap meet, big rig displays, vintage trailers, Hot Rodders of Tomorrow Competitions and a dedicated kids zone are just a handful of attractions that make the Summit Racing Equipment Atlanta Motorama one of the country's largest motoring festivals of its kind. Participant entry into the Summit Racing Equipment Atlanta Motorama is still available and open to anything with an engine, ranging from classic cars, muscle cars, custom cars, imports, rat rods, hot rods, trucks, big rigs, motorcycles and even boats and RVs. Awards will be presented to hundreds of participants, and all participant entries will be eligible to win a portion of the nearly $20,000 in cash and prizes handed out at the show. Registration is available online by visiting www.atlantamotorama.com. Admission to Summit Racing Equipment Atlanta Motorama is $12 per day. Kids ages 6 to 11 will be admitted for $5, and kids ages 5 and under will be admitted for free. Camping at the speedway is available during the event, and full hook-up or dry camping can be reserved for the weekend. For more event information and to purchase tickets, contact the Atlanta Motor Speedway ticket office at (770) 946-4211, (877) 9-AMS-TIX or visit www.atlantamotorama.com.